This extremely fast prime lens is ideal for those who want a combination of superb low-light recording with a telephoto look that easily throws backgrounds out of focus. It features a longer focus rotation and continuous iris, or aperture adjustment. Its beveled, cine-style housing provides a clear view of distance marks throughout the focal range. Its optics are capable of 4K recording quality and, in keeping with professional cine and broadcast TV users, focus and aperture operation are completely manual. The entire range of CN-E lenses have a consistent 114mm front diameter, making it easy to change lenses, especially when using a matte box, filters or geared accessories. 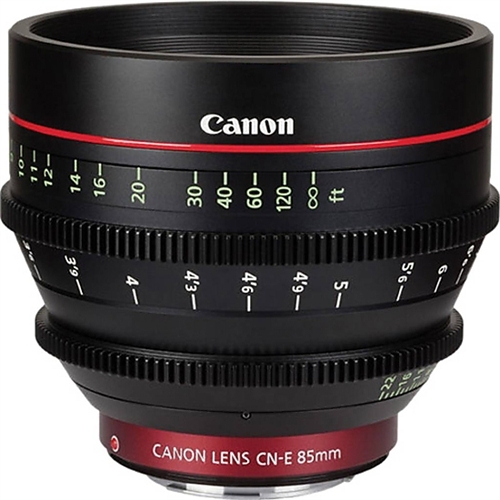 The Cinema prime CN-E85mm T1.3 L F (EF mount) Lens offers a compact, consistent lens design and proven Canon lens elements for performance and reliability in professional shooting environments. Intended for the working professional, the EF Cinema Prime CN-E85mm T1.3 L F lens has markings on angled surfaces on both sides of the barrel, making it easy to read focus and aperture settings from behind or from either side of the camera. Focus markings can even be switched from standard labeling to metric. The control rings are engineered to maintain the proper amount of resistance with consistent operating torque. Designed to fulfill contemporary 4K production standards, it features a full-frame imaging circle in a lightweight, compact design-this phenomenal lens is perfect for any number of applications. It features an 11-blade aperture diaphragm for beautiful background blur and innovative glass construction that counteracts barrel expansion and contraction to avoid temperature induced marking discrepancies. Canon's brilliant Cinema Prime lenses offer spectacular optical performance for demanding high-end productions. Featuring a compact and consistent lens design, these lenses offer consistent form factors and markings optimized for motion picture production. Sharing the same gear position, diameter and rotation angle, and front diameter-the lenses' compatibility with third-party accessories allows crews to easily change lenses without making adjustments to the rig setup. Perfect on the EOS C300, these lenses are also compatible with all Canon EOS DSLRs.